This is an American Session Ale brewed to honor the crew of U.S.S. Fort Worth. U.S.S. 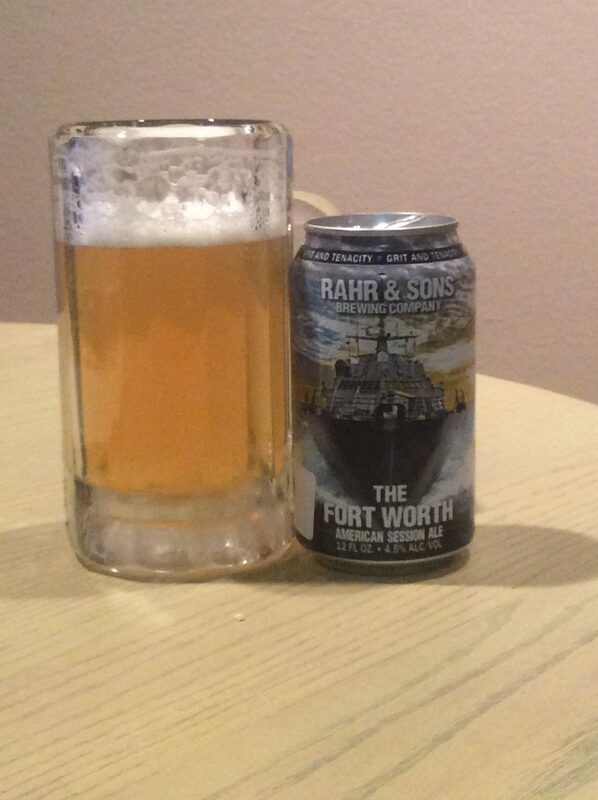 Fort Worth is a Freedom Class littoral combat ship named after the city of Fort Worth, Texas, the home town of Rahr and Sons Brewing Company. This was my first American Session Ale and I must say it is pretty good. It is light and crisp. Pouring from the can (more on that in a minute) it is golden yellow and formed a good head that settled quickly. The hear was an off-white color, my wife would call it almond. Taste of grains, grass, and spices come through to me. To the nose, aromas of spices and yeast are the most evident. There’s a very faint, almost citric (lemon-y?) tang that never quite asserts itself. Light-medium body. Lively carbonation. Slightly sticky mouthfeel with a grainy texture. Most of the brew from Rahr and Sons are only available in cans. According to the brewer, cans protect from UV light and oxygen contamination. Of course, Aluminum is light than glass and does take up less space and that makes it cheaper to ship. All that being said, I still prefer beer in glass bottles. I think that is because the mass-produced beer of my college days always tasted somewhat metallic and I think that has ruined me for life on that point. All in all, I like this Ale, mostly because of the taste, and slightly because they decided to honor the crew of a warship.